Let’s Enjoy a Night of Philosophy and Ideas! You must be a member of the Houston Culture Quest Group to attend this activity. Would you like to join this group? The Moody Center for the Arts and the Cultural Services of the French Embassy will present A Night of Philosophy and Ideas Protected content , a unique event bringing philosophers, musicians, artists, and authors from around the world together with the Houston community through a series of conversations and performances from 7:00 p.m. to 1:00 a.m. on January 26, Protected content , at the Moody Center for the Arts, Rice University. In honor of the Paris Climate Accord and the leadership of the French government in addressing climate change, the theme of the event will be ecology, with a keynote presentation by philosopher and Rice professor Timothy Morton and internationally renowned multi-media artist and performer Laurie Anderson. A Night of Philosophy and Ideas Protected content explore how collective dialogue and cultural insights can prompt environmental action and motivate national and international change. Taking place for the first time in Houston, A Night of Philosophy and Ideas has been held in diverse international cities, including Paris, New York, London, and Berlin, and serves to link Houston to the larger international discourse. Throughout the night and into the early morning, philosophers and performers will present topics and debate ideas on a wide range of issues pertaining to ecology, including how environmental concerns intersect with ethics, religion, anthropology and social justice. Participants will also enjoy musical performances, film screenings, and interactive performance artworks. NASA oceanographer Josh Willis will perform as Climate Elvis, addressing the science of climate change through popular performance. Artist Jae Rhim Lee will demonstrate the benefits of committing our bodies to a greener Earth through a special burial suit seeded with mushrooms. Open Dance Project will perform periodically in the galleries throughout the night. The evening will culminate in an exuberant midnight performance by New Orleans Hustlers Brass Band. The Moody has commissioned Houston-based artist Natasha Bowdoin (b. Protected content create a site-specific work that will fill the 24-foot wall of the Central Gallery. Known for her collage-based works made of cut paper and other materials, Bowdoin investigates the potential intersections of the visual and the literary, channeling the experience of reading into the activity of drawing while reimagining our relationship to the natural world. An exhibition of new work by the French artist Michel Blazy (b. Protected content be on view in the Moody’s Brown Foundation Gallery. Exhibiting for the first time in Texas, Blazy is known for working with live and mutating materials in projects that bring attention to the natural transformation of matter over time, often with elements of poetry and humor. The acclaimed documentary film, Living in the Future’s Past, will play in the Lois Chiles Studio Theater. This beautifully photographed original work, created by Susan Kucera and narrated by Academy Award winner Jeff Bridges, asks the question, “What kind of future do we want to live in?” and brings new insights into the environmental challenges confronting the modern world. Throughout the event, refreshments by the event's sponsors Phoenicia Specialty Foods and Buffalo Bayou Brewery will be available for purchase in the Café Philosophes, staged in the Moody’s open creative studio. Free coffee will be provided throughout the evening by Katz Coffee. 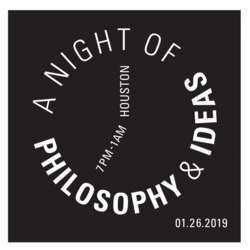 The Protected content Night of Philosophy & Ideas in Houston is being presented in conjunction with La Nuit des idées, a worldwide event taking place in over Protected content in January Protected content .